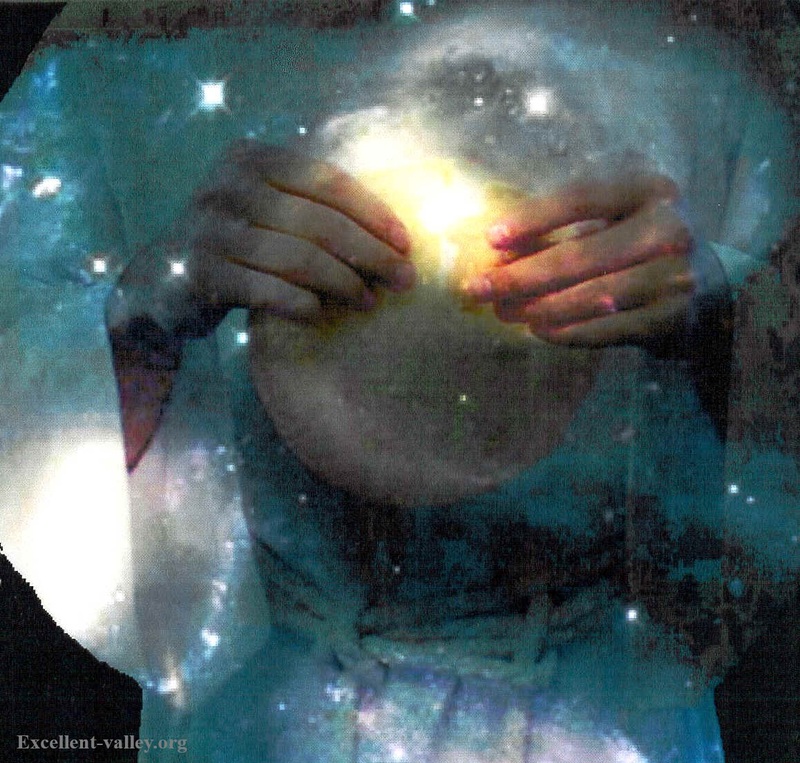 The above picture is an overlay of a transparency depicting the Lord Jesus, the Creator of the Universe, breaking bread in the midst of a partial photo of the Stephan's cluster of five galaxies. Ages ago these galaxies violently collided with each other, and in all probability are continuing to play havoc on each other's domain. The photo of the Stephan's Quintet, as it is known by, came from the Hubble Space Telescope. The view of the galaxies, without the overlay, may be seen in the next chapter, “Collisions”. Arise, Shine for thy Light has come. This is My Body given for you. With a Summary of the Visionary Dreams. Sin shall not have dominion over you, and yet ignorance remains in the church. This is My Blood of the New Covenant, which is shed for many for the remission of sin. The following scripture was written in the Letter to the Hebrews exhorting the Jewish converts too look fully to the sacrifice of Jesus Christ, Yeshua haMashiach, for their present sins of the flesh, and not to the old animal sacrifices in the mosaic covenant. (See the Blood of the Lamb.) The admonition is absolutely true for the gentile ecclesia/church. Now the entrance into the Holiest is made through the Communal Body of Christ that has been set apart in Baptism, and is now cleansed of their confessed faults of their flesh through the Holy Spirit's application of the sanctifying Blood of our Savior. Because of God's New Covenant, the baptized believer in the true faith of Christ has the confidence to enter into God's thrown room of Grace so that we may approach (draw near) to God in faith with a clean conscience, having the actions of our flesh washed clean in the Water of the Spirit that is of Christ Jesus. Now then, let us hold fast the profession of our faith without wavering, for He is faithful that promised. God will not only answer the hope of our Salvation in Christ Jesus, but will also answer our prayers and petitions that glorify the Name of our Salvation. The 'many'; are those that have already entered into the New Covenant with the Lord. This beginning of new Life for a person, began with their initial repentance and confession of faith, that is made public with their baptismal washing into the Water of the Spirit, and now the old past is washed away, and behold all things are made new. With the grace of God in Christ Jesus, we have a new beginning faith in the Life within the Living Body of Christ our Savior. Then again to live, the natural body needs the continuing life flow of the blood to nurture our being and cleanse us of the waste of the flesh; and now our new Life in the Body of Christ is in the Living Blood that flows as One with the Holy Spirit of Christ Jesus. Let's review these passages in Hebrews chapter 10 verse 19 thru 22, and make a list of several, reasonable and spiritual observations. 1. The Lord Jesus, by His Word at the Passover Seder of Unleavened Bread, inaugurated a new and living remembrance of the New Covenant in His Flesh and Blood. Jesus, the Son of Man, took [unleavened] bread and blessed it, and broke it, giving it to His Disciples, and said: Take and eat, for this is My Body given for you. (Unless you eat of the Flesh of the Son of Man and drink His Blood you have no life within you). And He took the Cup, and gave thanks, and gave it to them saying: "All of you drink of it: For this is My Blood of the New Covenant, which is shed for many for the remission of sins". (See Matthew, Mark, Luke and John.) It is at this time at the Passover Feast of Unleavened Bread, and this time only that the WORD of GOD establishes Holy God's promised eternal Covenant with man. The old inferior covenant was in the blood of animals, but now, the Everlasting Covenant is in the shed Blood of the Soul and Spirit of a Man of perfect Love and Righteousness, in the likeness of His Father God. Jesus Christ is the Lord our Righteousness. 3. This scripture in Hebrews also speaks of the plurality of the church body such as, 'brethren', 'us', 'our hearts', 'our bodies washed', as in a collective unity called the 'House of God', or the 'Body of Jesus Christ'. For through Him (Jesus/Yeshua), we both (Jew and Gentile alike) have access by One Spirit unto the Father. Now therefore you are no more strangers and foreigner, but fellow citizens with the saints, and of the household of God. Because of the unity of the one Body; the eye of the body cannot say to the ear of the body, you are not part of me because you cannot see. 4. The Lord God has called us to worship Him in Spirit and in Truth, which in the essence of Godly faith, is with a true undivided heart of Agapao/Love like unto God's Son, Jesus our Lord. That which is unseen within our gift of faith, holds the substance of Truth to be self-evident in our hearts, for Jesus Christ being the Word of God is the Personification of Truth, and One with the Father's Perfect sacrificial Love. The Word of Truth establishes that Holy Communion through the unseen dimensions of Christ's Flesh and Blood is One with God's Holy Spirit of Truth, and the Faith of Christ is our beginning entrance into true corporate worship of the Eternal God and Father of all the redeemed. 5. The baptized into the Faith of Christ, being parts of the One Body of Christ Jesus, are to be partakers of the Communion unleavened Bread of Life where there is no division, but only the wholeness of unity within the Spirit of the Lord. But before we can come with holiness through the one Body of Jesus Christ into the presence of our Holy, Holy, Holy Father God, then it is necessary that each individual member, examined themselves with a heart of humility that will speak of repentance from our thought and acts of self centeredness. Then we are to show our total dependence upon Christ as we all drink together in renewing Faith in the cleansing essence that is in the New Covenant Communion Blood of our Savior and Lord. The Holy Spirit, being One with the Water and the Life Blood of our Savior, applies to our repentant hearts the cleansing power of the grace of God's Sacrificial Love. The Holy Life of the Son of God, which is in the Spirit of His Blood that we drink of, is the Soul and the Spirit of Jesus Christ, the very Life force of the corporate Body of Jesus. As it is written: Except you eat the Flesh of the Son of Man and drink His Blood you have no Life in you. He that eats My Flesh, and drinks My Blood, dwells in Me and I in him. As the Living Father has sent Me, (The True Bread) and I live by the Father, so he that eats of Me, even he shall live by Me. This is the Bread that came down from heaven. (See John 6 verse 53 thru 58.) No flesh shall glory in God's Holy Presence, for the flesh of man is full of its own self idolatry. The sinful flesh of the natural man is put away from God with the sprinkling of the Communion Blood of Christ Jesus by the Holy Spirit of God. There is only those souls, born of the Spirit of the Son of God and seek to worship God in Spirit and Truth that would be found in the Presence of Holy God, the Almighty. 7. In Holy Communion, the anamnesis (remembrance) of the Infinite New Covenant set in the Blood of God's Son is again sprinkled on the hearts of New Covenant believers through the Holy Spirit, Who is One with the Holy Blood and the Water of the perfect sacrifice of Jesus Christ. That perfection is a gift that only comes by the sacrificial Love of God's Perfect Son, Jesus Christ, Who was born the incarnate Son of Man to take away the sins of the world. For the believer, Holy Communion is a continuing renewal of that person's repentance and faith, so that they may have in remembrance a comfortable sense of God's faithfulness in pardoning our sins even of yesterday and today. Because of our faith in the Communion Body and redeeming Blood of our High Priest Jesus Christ, we can have full assurance of our entrance through the veil of His Flesh into the Holy of Holies. This is the Place of God's heavenly Sanctuary, where all the priestly children of God in Christ, come to worship Holy Father God in the Agape of the Son, and to present our prayers of intersession that will glorify the Almighty God. It is here that we can expect to receive from the Father's holy will and council for the Church, for it is the Father's good pleasure to give His chosen the Kingdom of His Heart. Note: The subject matter in both Hebrew's 9 and 10 concerns the sprinkling of the Blood of the Covenant and more specifically to the New Covenant in the Blood of Jesus Christ. So that there is no mistaking this fact, I added the notation (with His Blood). If the reader has clicked on the yellow highlighted link for "sprinkled" then you will see that in every case that it was blood that was sprinkled on everything and everyone that was to be separated unto God. (See Hebrews 9 verse 19.) The water of separation was a preparation from the combined ashes of a red heifer, cedar wood, hyssop and scarlet, and was a purification for sin and those associated with death. At the appropriate time of purification, then running water was added to the combined ashes of the red heifer, cedar wood, hyssop and scarlet, and sprinkled on anyone who was associated with death. Observing with interest, we see Paul as he cries out: Who shall save me from this body of death. Prior to the Lord Jesus' brutal crucifixion, passion and death, the Lord, in anticipation and in accord with His Father's doctrine, inaugurated or dedicated for His people of living faith, His Table of Covenant Remembrance of His passion and death that He would suffer for humanity's sin. At the Lord's Table, through the Holy Spirit of Grace, Christ's real Blood of the Covenant covers over our recent sins and omissions attributed to the nature of fallen flesh. It is vitally important to understand that the New Covenant, in the Blood of Jesus Christ, was consecrated in His Soul by that which was thought and spoken by the WORD of GOD, even before the first drop of blood flowed from the pierced Body of the Christ of God. He was the Lamb of God that was slain from before the foundation of the world. In His crucifixion and while His Life Blood was being poured out of His Body unto the ground, the Lord said, "It is finished" and bowed His head and gave up His Spirit. Then the soldiers came, and one of them pierced His side and out flowed onto the earth, the balance of the Serum Water and the Blood that had pooled in the Lord's thoracic cavity. God's signature was thereby established in the earth, with God's New Covenant signed in the Blood of His Son. When the Lord Jesus arose from the dead in power through God's Holy Spirit, He returned to His Holy Father, confirming in the Power of His resurrection that His Father's New Covenant in His Blood was eternally active in the earth, and God's Holy Spirit, One with the Son of God and Son of Man, could now be sent to faithful believers, reproving them of sin and cleansing them by the Life Blood of God Almighty's Son, Yeshuah/Jesus, that was poured out for the sins of the world. Now is the time for the Bride to ready herself, and to have a foretaste of that Eternal Life of Jesus Christ through the regenerating Life Blood and Body of our Savior. For when the kindness of God our Savior and His love for mankind appeared, He saved us—not by works of righteousness that we had done, but according to His mercy, through the washing of regeneration and renewal by the Holy Spirit. He poured out this Spirit on us abundantly through Jesus Christ our Savior: (Please see confirming Scripture text in HCSB.) So then, the foretaste begins with the washing and regeneration of the Word of the Spirit with the Serum flow of Water always carrying us to the altar of repentance, where at the Cross of Jesus Christ, we see our sins of death, crucified to the One Who holds the Keys of hell and death. And behold Jesus says: I AM He that lives, and was dead; and I AM alive for evermore, Amen; and have the keys of hell and of death. Our God of the living, is holding the keys to eternity, and gives the believers an invitation through fellowship in His Body and Blood, to pass over our earthly existence into the fullness of the one Holy Faith of God's Spirit of Grace, taking us into God's Holy Presence. The Church Body, being in attendance to worship Holy Father God Almighty in Spirit and Truth, is brought to Life by the active cleansing Serum Water from the Fountain of Life, Being the Holy Spirit of the Word of God. The Word that is faithfully preached, is to make ready the people of God to begin their entrance to God's Throne Room of Grace, through the New Living Way, through the Bread of Life and the New Covenant Blood of Jesus. Our God, Jehovah-Jireh, will provide in Holy Communion, through His Holy Spirit of Grace, the unfathomable dimensions of Jesus' Body and the New Covenant in His Holy Life Blood that cleanses all believers from their confessed unrighteousness in the flesh, and covers with God's Love the unknowns of self centered idolatry. Now then, having been brought together, as a collective in the one Body of Christ through the Bread of Life, and nurtured in the bonds of love and peace in the Holy Ghost, the covenant Bride would enter into the Holy of Holies through the veil of the flesh of Jesus Christ, where the Holy Spirit would continue to lead His people into the presence of Holy Father Almighty. For, this is Life eternal that they might know Thee, the only true God, and Jesus Christ, Whom Thou hast sent. (John 17 verse 3.) Ideally, this is the spiritual time and place where true corporate worship with thanksgiving and praise of God should be initiated. This is the place where our collective hearts are brought into a truer intimacy with the God of Creation; the One and only true God, Who is unfathomable Love, and the One Who knows the heart best. If the ideal is not possible because of unbelief and blatant doctrinal errors in a church, then perhaps it is even better for the two or more of the redeemed within a home gathering that they should come together within the Body of Christ, accepting gratefully God's eternal Bread Offering of His Son and His sanctifying Blood given by God's Holy Spirit. The entrance into the extra-dimensional kingdom of the only true God and into His Glorious Presence, is close at hand for all the faithful communicants. But how is it, that even in the liturgical communions, just when the house of God would be arriving into the Holy of Holies, and into the Father's Holy presence, the service is dismissed, the congregation does an about face, and out the door they go? Who is it that waits upon the Father in worship, and waits in anticipation upon hearing of His Good Will? So then, is Communion in these churches to be a perfunctory ritual; or a true searching to know better the Heart and Love of God? Unfortunately, Communion in so many churches can be entrenched in a dogmatic ritual as a necessary duty of the institution, rather than a true act of bonded Love with Thanksgiving for what the Father of our Lord Jesus Christ has given to us of His Holy Spirit. Without the Faith of the Spirit it is impossible to please God. Now because of un-confessed sin born of idolatry, idolatry combined with heresy, heresy rooted in the pride of false teachers, there will be few who really enter into a fuller expectancy and understanding of the absolute Holiness of the moment, thereby anticipating a greater intimacy within the waiting heart of Holy Father God Almighty. God does not respond, because the hearts of the people are buried in their own flesh. But in a time past, the Lord says: If My people, which are called by My Name, shall humble themselves, and pray, and seek My face, and turn from their wicked ways; then will I hear from heaven, and will forgive their sin, and will heal their land. Now Mine eyes shall be open, and Mine ears attentive unto the prayer that is made in this place. (2nd Chronicles 7 verse 14.) As Holy Yahweh God Almighty spoke to His Jewish people at that time, so He continues to speak to all of His New Covenant People, Jew and Gentile alike. Thy throne is composed of righteousness and judgment; mercy and truth go before Thy Face. Happy are the people that know how to enter into joy; they shall walk, O LORD, in the Light of Thy Countenance. (Psalm 89 verse 14 thru 15.) God's Words for repentance to His people holds True in any time frame! In 1852, the Presbyterian teacher John M. Mason in his letters on frequent Communion, volume 1, writes: "It is by no means improbable, that the restoration of scriptural Communions, may usher in a time of refreshing from the presence of the Lord. It has just been shown, that no mean will more effectually conduce to the revival of love; and with the grace of love every other grace flourishes. In that sweet confidence and endearment, which are inseparable from it, believers strengthen each other's faith; and are helpers of each other's joy; nor is there, in the whole circle of social graces and duties, any which the Lord more delighteth to honor. Beside, the nearer a church approaches in her worship to the institutions of the Lord Jesus, the more solid ground has she to implore and to expect his countenance". But generally, as far as the non-liturgical Protestants are concerned, the thought of the spiritual Communion possibility, with God's Glory being exhibited, and His Holiness being spiritually discerned among His people, has never entered their collective minds, and currently would be impossible with the irrelevancy that is placed on Communion. The evangelical Protestants have deemed their doctrines, with the exclusion of the holiness of Communion, as being self sufficient in finished sanctification. But, it is written that no flesh shall glory in the presence of God, (See 1st Corinthians 1 verse 29.) thus, those in the flesh, void of repentance, and without the sprinkling of the Blood of the Lamb of God, will stand without in the outer court, excluded from the potential glory of the moment. Revival of the dead in sin, even those in unbelief, awaits their humility and confession. But the hour cometh, and now is, when the true worshippers shall worship the Father in Spirit and in Truth: For the Father seeks such to worship Him. God is a Spirit: and they that worship Him must worship Him in Spirit and in Truth. (John 4 verse 23 thru 24.) In the Holiest Place of God, the angels cry out Holy, Holy, Holy is the Lord of host: The whole earth is full of His glory. Isaiah sees himself as a dead man in the presence of the Lord, until the Lord sees to it, that Isaiah's iniquity and sins of his heart and spirit, have been purged from him by the hot coal placed on his lips: (See Isaiah 6 verse 3 thru 7,). For out of the abundance of the heart the mouth speaks. To make it clear for all of us, our sins as well as our blasé attitude prevents that which is possible with Holy, Holy, Holy God. (See Acts 2 verse 1 thru 4 and verse 42 thru 43.) Without repentance from the selfish works of the flesh, along with our expectant faith in the cleansing Blood of the New Covenant, then the divisive nature and demands of our flesh will prevent the Spirit of God's Holiness, and His Glory to be manifested among all His people. The unanswered prayers of God's people are waiting upon the people's repentance. To proceed to the next chapter, please click on “This is My Body given for you”. This is My body, which is given for you: This do in remembrance of Me. One night, in 1984, I dreamed two dreams. The surrealism of spiritual dreams can be very subtle, and yet startling in their revelation. The visionary dream began, as if I was caught off guard, or daydreaming, for I was in my evangelical church in the midst of worship service. There I was seated in a pew observing my knees and my hands, which were grasping a full plastic communion cup of grape juice. Knowing the established order of receiving the communion of 'The Bread' first, and then the 'fruit of the vine' second, I was embarrassed for myself, for having seemingly slept through such an important moment. It seemed apparent to me that the 'Bread' had already been given, of which I could not remember having received. I hurriedly gave thanks to the Lord for His precious gift of His Life Blood, and drank fully from the cup. Upon finishing, I then sheepishly looked about the church congregation, to see if any one had noticed my slumbering. To my chagrin, it seemed the whole congregation, including our Pastor, was patiently waiting for me to fully finish communion, for indeed I had not received the 'Bread', but only the Blood of the New Covenant. At that time, two of the choir men, with whom I was familiar with, came to get me so that I might finish Communion. However, I had another dilemma. I began to wonder if I should receive the Bread (The Body of Jesus Christ), since I was considering leaving this charismatic Protestant Church, and would no longer be a member of the congregation. My thoughts turned to the Holiness of the Lord, and the gift of His Body, as I pondered in my heart my unworthiness. I could not refuse HIM (Jesus), nor could I refuse any member of the congregation (The Lord's Body of believers), including the pastor who was waiting for me. As the three of us walked down the center isle toward the railing, we began singing a glorious song of praise. Though not familiar with the song, I caught on quickly, and began to sing out with the rest of the congregation. As we were reaching the altar railings, the song of praise began to crescendo for the finale verse. But then all of a sudden, I alone was bellowing out the last words of the praise in a high note, as the rest of the congregation whimpered, or peeped the remaining phrase. Momentarily, I felt embarrassed with my bellowing, but then I began walking toward the pastor, who was standing on the main floor outside the railings, and to the left of the center aisle. Upon reaching the pastor’s position, I took a flat, white, circular communion host from the plate, and then returned to my seat giving thanks to Jesus for His great love for me. As I was returning to my pew, the unleavened bread enlarged three times in my hand, and momentarily displayed an inscription of, 'ROBERT'S MEMORIAL', around the top edge of the circumference, and then the inscription disappeared. I sat down and consumed the Lord's body, and it was sweet in my mouth! I mention the sweetness, because of the spiritual significance. "Follow the way of love, even as Christ loved you, having given Himself for us, an offering and sacrifice to God, a sweet smelling savor." (Ephesians 5 verse 1 thru 2.) Very interestingly, the quality of bread that this church had served in the natural setting was marred, given that the oil in the bread was usually rancid in my mouth. Even during the spiritual dream, my mind was aware of this problem of natural oil rancidity, in the bread that was presented as the Body of Jesus Christ. In the visionary dream, immediately after consuming the Lord's sweet Body, I was awake, as if not asleep at all. I pondered the visionary dream for a few moments, and then quickly fell asleep, and found myself off into a sequential dream experience. The second Communion dream of the same night. I was in the entrance to the foyer of a Roman Catholic Church. To my immediate left stood one man, and to my right was a priest dressed in a black tunic with a white collar, and a black head piece. I heard them talking to each other. The man to my left had a look of great dismay on his face, as he was expressing his sense of loss, even while standing in that church building, and in the presence of the priest. The priest, trying to reassure the man, implied that he was in the right place, and mumbled some thing about the great traditions of the Catholic Church. Concerned for the man, and not satisfied with the response from the priest (who in the dream represented spiritual authority), I sheepishly interjected to the man, that he should seek after Jesus Christ, his Savior with the entirety of his heart. Note: The Roman Catholic Church has taught that the church's traditions, along with the papal and council decrees, have held the same authority as the Bible, or the Word of God. While it is true that the apostolic traditions of the early church, as seen in Scripture (Sola Scriptura) remains effectual to the Body of Jesus Christ, however, those teachings that depart from the heart of Scripture have brought spurious traditions that lead to confusion, and a separation of the collective heart of the people, who should be seeking after the Heart of God in Spirit and Truth. Obedient love and devotion to God the Father, through His Personal WORD and Son Jesus Christ alone, is the sufficiency of the universal faith, which reveals that ones trust and faith in Holy God, justifies the soul, showing within us through His Spirit, the mirrored love of Christ, being manifested to the world. I then walked between the two men into the main sanctuary, with a resolute understanding in my mind; I was there to receive (actually take or steal), seemingly out of dire necessity, the Communion Body of the Lord, from the tabernacle. As I stood there alone for a moment, I saw the height of the ceiling, and can recall that the church had a Gothic like structure. Certainly for the religious, the building had a satisfying religious atmosphere. It was dimly lit, with some sunlight coming through the stain glassed windows. Then I began to walk the center isle passing the many empty rows of pews, straight to the tabernacle where the bread was stored. I suppose in Roman Catholicism, I was about to commit a sacrilege, for with my own hands, I was going to help myself from the tabernacle. While approaching the entrance to the altar, I saw to the left of the altar, and outside the railing and tabernacle, a dark, even black rectangular hole in the wall, which resembled a food serving pass through. Puzzled, I was drawn or pulled over to this dark opening. As I stood in front of the opening, looking into the darkness behind the wall, I saw to my left, the torso of a man, clothed in white garments, behind the rectangular hole in the wall. I never did see his face, for his head was above the lentil of the pass through. He moved towards me, and I instinctively reached out my right hand, and at that moment he placed a small white circular host of unleavened bread upon my opened hand. I thought about the strangeness of receiving communion in what seemed like an impersonal manner, but then again that is our perception, created by the spurious doctrines of men. In that next moment, I was turned to my left, and not in the direction I had come from, and began quickly moving toward a large Door in the side wall. Approaching the solid Door, I became quite concerned, because I couldn't stop my travel and I was going to feel very embarrassed when I ran into that Door. Even if there was time to open the Door, there was no handle on the Door for me to turn. As I was looking around I began saying to myself, who’s going to open the Door? Is there any one here that will open that Door for me? It seems like I was being driven with a purpose, but not of my own accord. I braced my mind for the collision that was about to take place, but I passed completely through the solid unopened Door as if it were not - there at all. Immediately, I found myself outside of the building’s block walls, and into the light of day. I was standing, as it were, in lush green and rolling pastureland that went as far as the eye could see. It also seems to me that there may have been a solitary tree standing beside a still river. But, my minds attention returned quickly to the Holy Communion Host, which was still in my hands. When my gaze again rested upon the Bread, the Bread had a golden glow behind and through it, and had enlarge itself many times in my hands, initially gaining in size to the circumference like unto a volley ball. The Bread remained flat or thin, semi-transparent and interlaced with many small irregular, perfectly fitting pieces, and seemed to be whole and complete. The Bread was like a jigsaw puzzle with miniature pieces, and yet still one piece of Bread with no separations between the many infused pieces. I was compelled to raise this 'one whole piece of bread' to my wide opened mouth, and began to eat. I was uncontrollably gobbling down that Heavenly Host; I emphasize, because now it kept enlarging in my hands, as if the Bread was alive and never-ending. The more I ate, the more there was, the more there was, the more I ate. My hands, which I could not control, were shoveling that 'Holy Bread' down my throat, as if the 'Bread' was a conveyor belt it self and extended it self far beyond where my eyes could see. It seemed my Life depended on that One Bread, and I could never be filled till I came to the end of that bread, and yet the Bread would never end. With my mouth wide open, I opened my eyes as if I had never been asleep. Even though there are different functions in the natural body, each and every cell of that body has the same identifying DNA in the nucleus of the cell, and each healthy cell functions to support the total maintenance for the wellbeing of the body. Although the DNA remains the same in every cell, the cells were differentiated by the zygote, whose instructions bring about the needful specialized functions of the cellular Body to make the Body, a whole, self-supporting entity. A zygote is the male fertilized ovum of the female that has all of the cellular instructions for the creation of the species. So it is with the Body of Jesus Christ. Our souls are like an ovum to be impregnated by the Seed of the Word of God through our faith in Jesus Christ, Who is in union with God's Holy Spirit. As such, you might say, we all have the same exact spiritual genetics of the WORD, being all members together in the one Body of Jesus Christ. The Holy Spirit, binds us together in the Love of God, so that we would function as one, to the glory of the one God Almighty. Our individual functional capacity in the Body of Christ, is set in motion through the Holy Spirit, Who through the Seed of the WORD, differentiates each member to function in accord, to God's Love for the holy good of the Body of Jesus Christ. The New Covenant Blood of Jesus Christ gives the members of the Body Life and security, for the Holy Spirit of Life is one with the Holy Blood of our Salvation. Without the Holy Spirit, Who is one with the Serum Water and the Blood of Jesus Christ, abiding in a soul, then there is no Eternal Life for that soul. To proceed to the next chapter, please click on The Memorial of Remembrance. Frankly, it took me quite some time to understand, 'ROBERT'S MEMORIAL'. I was a junior, obviously named after my father. My first given name was 'Robert', but I had always been called by my middle name, Glenn. This was a family convenience, so that I would not be confused with my natural father, and his identity with the name of Robert. However, the Holy Spirit did momentarily inscribe my first name on the Bread. Ironically in the dream, rather than recognizing my first name of Robert, which I had never acknowledged in public, I was wondering why a funeral home named, 'ROBERT'S MEMORIAL' was being advertised on the Communion Host. I hope you will begin to understand the spiritual irony, as we continue our exploration of the Word of Faith. Of a small note, my first given name 'Robert' means, 'Excellent', added before 'Memorial' in the Unleavened Bread, and the middle name of Glenn has the meaning of valley. "What shall we say? Shall we continue in sin, that grace may abound? God forbid. How shall we that are dead to (because of) sin, live any longer therein? (See Romans 6 verse 1.) It is a fact witnessed in the death of all of humanity, that sin's sentence of death had already been imposed upon me. Now then in faith, why should I continue to do the very things that bring death? Therefore, because of an active and believing faith in God's Amnesty Covenant in the Blood of Jesus Christ, I, who was initially justified by the baptism into Jesus and His death and resurrection, now saw in the Lord's Sanctifying Memorial of Remembrance in His Flesh and Blood, once again my own memorial of death to sin in Christ's death and resurrection from the dead. The initial justification with my baptism into the Serum Water of the Blood of Christ through the Spirit of the Word of God, remains effectual as a result of the Gift of God's Faith in Jesus Christ' eternal sacrificial Life-Blood, given on God's altar of the cross. (Click here to see God's Amnesty Program.) Wherefore seeing we also are compassed about with so great a cloud of witnesses, let us lay aside every weight and the sin which doth so easily beset us, and let us run with patience the race that is set before us, Looking unto Jesus the Author and Finisher of our faith; (See Hebrews 12 verse 1 thru 2.) The Scriptures make it abundantly clear, that sin continues to breed death in the flesh of man, even those who are being saved. Therefore let not sin have dominion over you, but resist sin and submit yourselves to God and the devil will flee from you. (See James 4 verse 1 thru 10.) The pride of the flesh will not humbly submit to the Almighty God for cleansing, but will work out its own twisted justification for sin without God's sanctification in the Blood of His Son, Jesus Christ. Now, my living declaration of faith in Christ Jesus' death, burial and resurrection, is the same as Paul's: I have been crucified with Christ. It is no longer I who live, but Christ Who lives in me; and the Life I now live in the flesh I live by Faith in the Son of God, Who loved me and gave Himself for me. (Galatians 2 verse 20.) Of the Truth, that is Jesus Christ, the experiences through the Communion dreams, have given me a clearer understanding of how the Eternal Father sees the finished perfection of His people that abide within His Son Jesus/Yeshua. Only the perfection of God's Love, working within the whole being of the resurrected Body, Soul and Spirit of God's Son, Jesus Christ, makes this possible. At this juncture, if I have word painted adequately along with Scripture, then we should have concluded through the Word of God and illustration, that each individually redeemed person, through the Body and Blood of Jesus' in Holy Communion, has an ongoing living memorial of death to carnal self within Jesus Christ, and His sacrificial death for us sinners. God’s purpose, in our Communion with His Word and Son, is that the heart and spirit of those of promise would be revived, and renewed, being knitted together in God’s unfailing Love. And now that the sinful flesh of man is dismissed from God's sight by the New Covenant Blood of Jesus the Christ of God, we can worship our Great God in Spirit and Truth. And so, when we each partake of the One Bread of Jesus Christ's Holy Body, and drink of His Spiritual and yet extra-dimensionally Real Blood, we remember that the primary reason Jesus died, is because of God’s Love for lost man, and so that individually we would not be eternally separated from God’s Love. We have been reconciled to God the Father, being found within the Body of Jesus Christ and cleansed through His Sanctifying Blood for our acknowledged failures in the flesh, and now in God's Grace we are too identify with our new Life exclusively within Him. For behold, old things have passed away, and all things have become new! For the Love of Christ controls us, because we are convinced that one has died for all; therefore all have died. And He died for all, that those who live might live no longer for themselves, but for Him Who for their sake died and was raised. From now on, therefore, we regard no one from a human point of view; even though we once regarded Christ from a human point of view, we regard Him thus no longer. Therefore, if any one is in Christ, he is a new creation; the old has passed away, behold, the new has come. All this is from God, Who through Christ reconciled us to Himself, and gave us the ministry of reconciliation; (2nd Corinthians 5 verse 14 thru 18. N.A.S.B.). We are to be refreshed in the Perfect Love of God, and renewed in the favor of the Lord's Life! Furthermore, in identifying with the same Sacrificial Love that God has bestowed on each one of us, we also are partaking, and identifying with our fellow brothers and sisters in the newness of their Life, and in the Love which is in Jesus Christ, regardless of their denominational background, race or natural gender! If Paul's romantic revelation of the person, who remains in Jesus Christ as being a new creation in Him and the abode of the Holy Spirit, then perhaps the whole of the splintered church would be reconciled to herself, as One in Christ Jesus. There will be only the one Bride of Jesus Christ. Partial Summary of the Night Visions. 'This is My Body'. 1. It seems that I was being driven or ushered through the visionary experiences, like a sheep or lamb that is driven through the gates by its Master. 2. In the Roman Catholic Church, the Blood of the sacrament generally is not provided to the congregation for expedience sake. In this website, see the erroneous Catholic Doctrine on Both Species. The green remarks in the partial treatise are of my own thoughts brought about from the visionary dreams. 3. My visionary excursion began with the partaking of the sacramental Blood of Jesus in the Protestant Church where it was offered. This was the beginning of two consecutive dreams, as the first dream began in the Protestant church, and the second finished outside the walls of the Catholic Church and into a lovely pastureland. 4. Most importantly, in the Protestant church, where it was offered, I received first unto myself with thanksgiving the fruit of the vine as the Covenant Blood of the Lamb of God, for sin's forgiveness. Does not the Lord of Life say: "This is My Blood of the New Covenant that is shed for many for the remission of sin". (Matthew 26 verse 28.) Because of its dynamic importance to faith, we bring an added emphasis to the Words of the Covenant: "for the remission of sin." Without the perfect force of the Blood of God's Covenant dwelling within the celebrants hearts, then the comforting word's to forgive sin are just rhetorical, lacking the authority of the Spirit of God, and the congregational members remain in their separating sins of the flesh. 5. After entering the sanctuary of the Roman Catholic Church, I did not receive or take the Bread of Life, being the Lord's Communion Body, from the Tabernacle within the Church. Even though the dream was spiritual, I believe it is truly apparent that the True Bread from Heaven was not stored in the Tabernacle. The Word of God bears this out; "You shall not offer the blood of My sacrifice with leavened bread, or let the fat of My feast remain until the morning". (Exodus 23 verse 18). 6. It is evident to me that the Bread of Life through the same Spirit is One and the same in all churches that would honor His saving Word. Please, consider the above scripture, Exodus 23 verse 18, and remember that we participating in the Lord's real offerings, and they are not to be defiled with our carelessness and unbelief. 7. Jesus Christ is the Redeemer of the hearts of men, and saves man into His Body through their Covenanting Faith in all that He is. It is not being a member of any institutional church that adds merit to the believer’s relationship to God and their position of service within the Body of their Savior. 8. In both dreams, the receiving of the Eucharistic or Thanks Offerings, took place outside the closed off designated altar area and tabernacle. Communion in the Body and the Life giving Blood of Jesus Christ is to be on the common ground of our humility, and our collective need for the Lord's unifying Holy Spirit. 9. True Faith or the lack of Faith in the substance of the Word's of Jesus Christ concerning His Holy Communion with His people, maybe the primary distinction between the celebrants of the Churches that are to serve the people of God, Catholic or Protestant. The Word's of Jesus Christ, our High Priest, are distinctly Divine Truth, and yet, for all the Truth that is in His Word declared Body and Covenant Blood, it requires a maturing of Faith that moves beyond the unbelief of reasoning mind of flesh. The Protestant Pastor in the first dream was directing and participating in the solemnity of Holy Communion, although not doctrinally sound with a completed passion for the sacrament. This matter of bold faith in scripture with proper instructions needs to be communicated with bold grace to the assembly of people, who ultimately consecrate to their souls the Body and Sanctifying Blood of Jesus Christ. By His Grace, all believers who are baptized into the death of Jesus Christ are invited to come worship, fellowship and dine at the Table with the Almighty God, as His children of Life and Light. 10. Because of false doctrines, all institutions are guilty before God, and encumber the Body of believers with their sin. For centuries, the exclusive tradition of the Roman Catholic Church has excluded the Blood of Jesus Christ from the people of the pews, leaving the Church in the darkness of men's doctrines, and without the true sanctifying life of their Savior. The Life of the flesh is in the blood, for the flesh, without the life blood, is dead. The Roman Church itself, caught up in their sanctified idolatry with its doctrines of demons, quite naturally became schismatic, and the Blood that saves them and would give sanctifying Life to its people, was deprived from its members. If the Sanctifying Blood of Jesus is cut off from its members, then they will become inactive and may fall away, as if dead. In the beginning of the reformation, the Hussites the followers of Jan Hus, a Catholic priest and advocate of John Wycliffe, did not see true Life within the Roman church, and left the Church in order to give its members both the Body and the Blood of Jesus Christ, and to look to the Word of God as the Fountain of Truth. 11. Even so, in the Roman Catholic Church, I am presuming that the Person, whose Face I could not see behind the dark rectangular hole in the wall, was the Holy Spirit. I understand that sometimes in a spiritual dream or vision, a faceless man can be emblematic of the Holy Spirit. It was He, Who gave to me the Bread of Life and opened my eyes of understanding. Looking at all the communal churches, the Holy Spirit brings the Oil of Gladness to His people that are redeemed from sin by the New Covenant Blood of the Lamb of God, and see themselves being sanctified as one in the Bread of Life. The False doctrines of the Churches, is rancid oil and is of no value to the people of God, and needs to be confessed for the sins that they are, and cleansed through the Communion Blood of our Savior, Jesus Christ. 12. Jesus (Yeshuah) was the Door I passed through. (John 10 verse 1 thru 9.) I AM the Door, by Me if any man enters in, he shall be saved, and shall go in and out and find pasture! Also, Psalm 23, may possibly have some roots in the dreams symbolism. verses 1 thru 3: The LORD is my Shepherd; I shall not want. He makes me to lie down in green pastures; He leads me beside the still waters. He restores my soul; He leads me in the paths of righteousness for His Name’s sake. verse 5, You prepare a table before me in the presence of my enemies. To proceed to the next chapter, please click on The Judas Heart. The whole of the above scripture reveals to the members of the One Body of Christ Jesus, of the Lord's Gift of Grace given specifically to called out members, where some are appointed to function within God's Holy Spirit of Grace as apostles and prophets, bearing the same unifying message of God's Holy Spirit of Truth to the evangelist, pastors and teachers that dwell within the Body of Christ. These specialized Gifts of Grace within the Body of Christ are given for the Glory of Holy Lord God Almighty, and His Eternal Word of Truth, Who was engendered from the original genetic flesh of God's creation of the first Adam/Man, and became the Man Jesus/Yeshua,. The whole of the Body of believers are to function in Sacrificial Love as one in Christ Jesus, even as all of the trillions of cells within the natural body, were designed by the Creator to sacrificially function together for the wholeness of that one physical body of flesh. So then we are to understand that Even as there are differences in the encouraging administrations within the Body [apostles and prophets evangelist, pastors and teachers], so there is in all the members of the Body, a diversity of operations through the same Holy Spirit of the Lord God Almighty. (See the diversity of necessities 1st Corinthians 12 verse 4 thru 14.) You are fellow citizens with the saints, and of the household of God, and are built upon the foundation of the apostles and prophets, for Jesus Christ is the Chief Corner Stone, in Whom all the building is fitly framed together and grows into a holy temple 'in' the Lord; 'In' Whom you are also built together for a habitation of God through the Spirit [of Life and Grace]. (See Ephesians 2 verse 19 thru 22.) In the Body of Christ Jesus, all of the individual parts are related to the whole, with Jesus/Yeshua being the Head. However, there are some noted paid pulpit theologians that are truly ignorant of the necessary workings within the natural body's DNA and Messenger RNA that were originally designed by God for the functional unity of the natural body's cellular workings: To wit, these same authoritative teachers are dismissive of God's calling of the like apostle and prophets given by God to be specialized gifts who through God's Spirit of Grace promote holy unity of the heart within all the called members of the Spiritual Body of Christ. The earthly wisdom of the nay sayers of the pulpit, have trumped the Wisdom of the Infinitely wise Lord God Almighty, saying: We have the full bible and have no need of the gifts of the former apostles and prophets, for they are passé' from an earlier time. Also, these same pulpit prophets dismiss the Life giving force of the Spirit of the God of the Living, Who gives to the Body of Christ the Communion New Covenant Life Blood of Jesus Christ. Have you looked up recently? The unfailing Truth of the Word of the Eternal Lord God Almighty, is declared in the expanse of the heavens, while the Power of the Light of the universe is emitted from the Infinite God's everlasting Word that is testified in the Bible by God's set apart men. (See 2nd Peter 1 verse 21.) The expanding heavens with its enumerable lights declares the glory of the Infinite God Almighty's unfailing Word of Truth that holds all things of His universe together within the order of His Infinite Wisdom. The Almighty and Infinite God of creation, in all instances has sworn upon Himself, for there is no other that He can swear upon than Himself. The Almighty is not as a mere man that would lie and pervert Truth. Therefore, consider that what is written in Scripture bares witness to corrupted mankind, and yet of God's assurances of His Great Salvation Gift of Life through Faith that is centered in the Light of His only Begotten Son, Christ Jesus. Thou art a High Priest forever after the order of Malchizedek. And the Word was made flesh and dwelt among us, and we beheld His Glory as the only Begotten of the Father, full of (the Spirit of) Grace and Truth. (See John 1 verse 1 thru 14.) The Almighty God, Who fills the void of His own creation with the Spirit of His Word of Truth, does not leave the the mind of the man seeking the Truth, to be void of the Light of Faith that is in Christ Jesus. Witness first that it was after the Jesus had dismissed Judas Iscariot from the Lord's Passover Table, that the Truth of the Word of God, Jesus Christ says to His disciples who were fellowshipping at the Lord's Passover Covenant Table of Grace: If you Love Me, (then) keep My Commandments. I will pray to the Father, and He shall give to you another Comforter, even the Spirit of Truth. I will not leave you comfortless, I will come to you. At that day you shall know that I AM in My Father, and you in Me, and I in you. If a man Loves Me, He will keep My Words; and My Father will Love him, and (then) We will come unto him, and make Our abode with him. (See all of John 14 verse 15 thru 26.) Note that in all cases where the conditional word 'if' is seen, then the Word of God is conditional to one's compliance to the condition set forth within the statement. The very next Words of Jesus Christ cuts to the heart, where there is the failure to meet the condition, for: He that Loves Me not, does not keep My sayings: and the Word that you hear is not Mine, but the Father's Who sent Me. The following Words of Jesus Christ were also spoken at the New Passover with the Feast of Unleavened Bread, where the Lord sets a condition of God's Sacrificial Love that is IN Christ Jesus. You have either read or heard that God is Love. Yes, it is absolutely True, for God's Love abides within His Word of Truth: But know this also that there is no darkness whatsoever in God's Love. The darkness of sin can not exist in the Presence of God Who is all Light. But, in Christ Jesus, the only God of Light and Love provides the only remedy, for the darkness of sin, WITHIN the Life giving Blood of His Only Begotten Son. Paul cries out: O wretched man that I am; Who can save me from this body of death? I thank (Eucharisteo) God through Jesus Christ our Lord. "Take and drink all of you, for this is My Blood of the New Covenant poured out for many for the remission/obliteration of sin". Therefore there is no condemnation to them that are in Christ Jesus, who walk not after the flesh, but after the Spirit. For as many as are led by the Spirit of God, they are the sons of God. (See Romans 8 verse 1 and verses 13-14.) In our Communion with Christ Jesus, the darkness of sin that is humbly repented of, is obliterated in the Light and Love of God that passes all of human understanding. Yahweh God is One God, and God's One Holy Spirit is in perfect union with His Eternal WORD, for God's Salvation WORD was conceived in the ovum of the genetically pure Hebrew virgin Mary by God's Spirit of Life, to be born in the flesh of Man/Adam. (See Genesis 3 verse 15.) Therefore the Infinite God's Holy Spirit is One with the Water and Blood of Life that flowed from the pierced Body of the Son of Man, our Lord and Savior Jesus Christ. The first Adam/Man, a son of God, committed treason against His Maker, therefore, before the creation of the foundation of the world, the Last Adam/Man was crucified. God's Justice would require the perfection of the Life of the Last True Genetic Adam, the Man Jesus Christ/Yeshua haMashiach, with His Sacrificial Love and absolute Trust of His Holy Father God, too totally satisfy the Almighty's justice within His Holiness. Holy, Holy, Holy Yahweh Lord God Almighty was Holy satisfied with the presentation offering of the Son of Man, the last true Adam, Jesus Christ; Now then, Yahweh the Almighty God, true to His Faithful WORD raised His Holy One from the dead of men, into the Eternal Life of His Eternal Father, God Almighty. Yahweh, the Almighty God of creation, has revealed the Perfection of His Love in Christ Jesus, by giving His Gift of Life to those who fully believe in His Salvation Word, Jesus Christ: For Jesus, God's WORD of Salvation, was crucified to death for the sins of this world of death and destruction. Therefore those who confess their belief in the resurrected Christ Jesus, are souls that are born a new by the Grace of the Spirit of God, and will continue to follow the leading of God's Holy Spirit in the Grace of the Almighty God of the living. The redeemed look for a Holy Ghost revival, but fail to recognize that God has provided for the revival of the fleshly dead in the fullness of His New Blood Covenant in His Son Jesus Christ. Thanks be to the eternally wise God Almighty, Who, in His New Covenant of Grace, in the Blood of Jesus Christ, provides for believers, God's Communion of intimacy within the Body of our Lord Jesus Christ. With our confession of fault, the Sacrificial Love of God Alone, will bring about the spiritual demise of the controlling death of sin within our troublesome idolatrous flesh. The condemnation of the force of sin within the conscience, ceases to be a force in God's Covenant of reconciliation in the Life giving Blood of Jesus Christ. Now then, with the new creation's humble repentance from the slavery of sin that resides in the flesh, God will sanctify the new creation in the Life Blood of His Son, Jesus Christ. That is, Holy God sets them apart from their idolatrous sins of the flesh, with the cleansing Grace within His Holy Spirit's new Covenant Life Blood shed by His Only Begotten Son, Jesus Christ. There are Three that bear witness (to these earthen vessels): the Spirit and the Water and the Blood and these Three are One. The slavery of sin that exist in the flesh, is no longer to have dominion over the saved, for God's New Covenant in the Blood of Jesus Christ, as the Incarnate Son of Man, provides for the believing man, an ongoing remedy for every sin of separation against God, that is committed by the selfish flesh of the redeemed person of man, but nevertheless, repentant soul of man! Within hours before His death on the cross, the Christ of God, as the Word of His Father God, instituted at His last Feast of Unleavened Bread, our Communion in His necessary nourishment in the Spirit of His Word of Life that sustains the Life of His Body of believers. Every time when the believers are to come together to worship God Almighty in His Spirit of Truth, it is to be at the setting of His Table of Sanctifying Grace. We are called together in Christ's One Body to worship God, as One unleavened Body in the Spirit and the Truth of God's resurrected Son, ever rejoicing in the Renewing and cleansing Power of the Lord Jesus Christ's Life saving Blood. No doubt, God's Spirit of Truth is grieved in man's doctrinal heresies with teachings that perpetuate mankind's unbelief. Without faith in God's Covenant in the real Life Blood of Jesus Christ, Yahweh God may not hear us because of our unbelief in the Truth: For through God's Holy Spirit, the True Vine Christ Jesus, provides His Holy Life Blood that separates repentant souls who live in the Vine, from the sins of the flesh that would hold our spirits captive. James in his epistle gives an admonition to the double mindedness of those being saved through God's Spirit of Grace, Who would dwell within the soul of our being. Whose mind do you follow; your mind or the Mind of the Spirit of God that covenants with you. If we say there is no sin in us, then we are in a state of denial, and are calling the Holy God of Truth a liar. In making God a liar, we are in complicity with the churches' of corporate confusion that unknowingly are in collusion with the stealthy author of sin and corruption. The nature of sin blinds us, and in the darkness of our own unbelief, we remain shackled in the prison of sin. Can you not see that unbelief puts us in direct opposition to the saving and freeing Doctrine of the Father's New Covenant in the Perfect Sacrificial Life that the Almighty God gave within the Blood of His only begotten Son, Jesus Christ. Sin is only committed to serve its own self satisfaction, and continues to deny the Truth of the liberating Power of the Blood of Jesus Christ. The single minded nature of stealthy sin will continually seek to maintain its strangle hold of self deceit that shackles the heart of a person to the rule of death; for the death of sin brings separation from the only Holy God of the Living. The shackles of sin are interwound and affixed to neurons within the earthly mind of our being, and the links of the chains need to be dissolved away in the Blood of Jesus Christ, thereby releasing the spirit of our minds to the Agape Rule of the Almighty God of the Living. For this to happen, it is absolutely essential, to have a true contrition within the heart of our minds, having the desire to forsake sin's self seeking desires. When we sincerely acknowledge to our Redeeming Mediator and High Priest, of our own selfish sins against God and man, then God is just and faithful to cleanse us through His Son's Holy Sanctifying Life Blood that Jesus shed on Calvary as the Son of Man, being of the Seed of the last Adam. Of the Truth that is Christ Jesus, the Revival of Life in Christ always takes place in God's Communion within the humble and thankful souls that have acknowledged their sins of the flesh. God gives us His freedom from the shackles of sin and death, by the Perfect Love and Sacrifice of His beloved Son. We are to honor God in the sacred tradition that the Word of God, Christ Jesus established for believers in the Feast of Unleavened Bread. Through God's Holy Spirit, the Body and Blood of Jesus Christ, is ever present in God's New Blood Covenant. The Holy Spirit of Life is ever ready to provide for the renewal of Life within the humble hearts that abide in faith within the Christ of God. The Truth of the Spirit of Christ Jesus exposes within our being, that we all are lacking within ourselves, the Perfect Love of God's only begotten Son that sustains eternal Life. That Power of the Perfect Love of God, is always present in the world, for though God's Holy Spirit of Grace, the Almighty's Covenant Empowerment is to be expressed in the world by the redeemed, who have a living faith in the Almighty Holy God of the living, and not a belief that is hidden away in a cloud of earthly dust. God's Merciful Love is always available to all Covenant souls, who find themselves dead in their sins and trespasses against God and man; and yes, also for all those who are confused by the will of their flesh; and yes, also for all those who are possessed by the pride of life and the lust of the eyes; and yes, also for all those who are right in their own eyes with their judgment of others; yes and also for all those who have erred in unbelief in the Father’s Doctrine; and no doubt yes, for all those who are heavy laden and broken in spirit, and finally for all those who are small in faith and fearful of heart. The following last section and chapters will come to a conclusion with further interpretations of these dreams, as well as with several other dreams that concern the people of God, and reprove the doctrinal conflicts within the all churches of superior philosophy. To proceed to the next section, please click on Confusion in the Church.